If you’re looking for a special golfing experience, we have the solution. Last year saw an array of visiting golf societies and charity days at Drayton Park Golf Club. We can look after all of your requirements from small groups up to large scale golfing days involving well over a hundred players. Our in-house caterers can offer a full range of options from a simple bacon sandwich to a formal three course presentation dinner for up to 100 guests. If you want to add in some individual prizes such as nearest the pin or longest drive, we can make all of the necessary arrangements for you. In essence, you decide what you want, talk to us and we can promise you a great day’s golf. The feedback that we have received from our visitors on all aspects of their day with us – the course, the clubhouse, the club shop and the catering – has been first class. 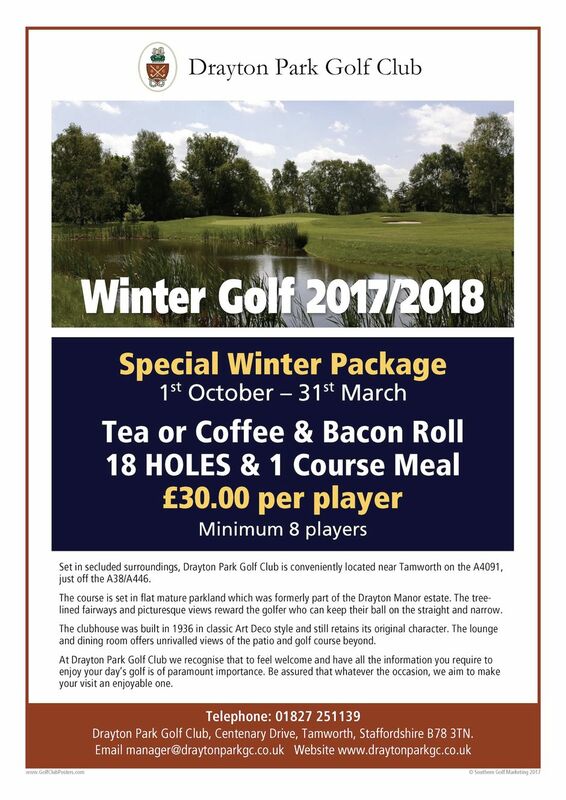 Please contact us for further details but please note that as a members’ club, weekends and some mornings throughout the year are reserved for club competitions. Download the Society Booking Form here.